Although I mostly read ARCs (Advance Reading Copy) these days, I’ve noticed that too often I come into a book series halfway through and I don’t enjoy the book quite as much because I’m not already familiar with the characters. When I think ahead enough, I will do a little research on my ARCs and see if it’s part of a series and then see if the earlier books are available at my local library. One of those books on my ARC reading list is Blue Lily, Lily Blue, the third book in The Raven Cycle by Maggie Stiefvater, and so I decided to start at the beginning … The Raven Boys. For as long as Blue Sargent can remember, she’s been warned that she will cause her true love to die. Now a young girl experiencing an interest in boys that warning begins to haunt her. Blue’s mother, a clairvoyant, each year stands and watches the soon-to-be-dead as the walk past her. Blue has never had this vision … until now. A boy, named Gansey, walks out of the woods and speaks directly to her. Gansey is a student at Aglionby – a private school for the wealthy. Blue has always avoided the boys from Aglionby (known as Raven Boys) because they are trouble. But she can’t help but be drawn to Gansey. He’s rich, very good-looking, has family and very strong friendships and yet he’s seeking something more and he’s drawing some close friends, and now Blue, into his search. This is not a light read. This story is dense with character development and story progression. In fact, I first listened to the audio version of this on my drive to/from work after checking out the CDs from my library, but I realized that I needed more concentration on this to really absorb what was happening, and so checked out the book instead. The story is really interesting and I look forward to getting deeper into the larger story, but at the same time I felt that this moved at a very slow pace. It became clear to me that this is primarily a set-up novel, giving the reader a lot of information about the characters, so that (presumably) future novels can get into more of the stories. I’ll likely skip over book two in the series to get to my ARC and hopefully I won’t have missed too much. Looking for a good book? 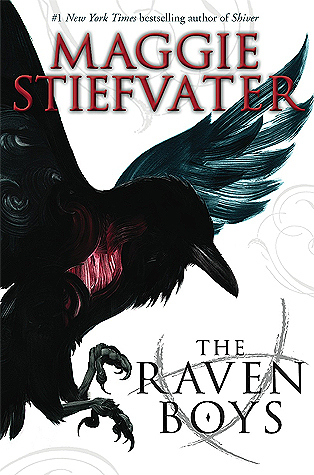 The Raven Boys by Maggie Stiefvater is a set-up novel, establishing characters and the world, which shows some promise of interesting stories to come, but this makes for a slow-moving first story.